This site presents the new multimodal SWELL knowledge work (SWELL-KW) dataset for research on stress and user modeling. The dataset was collected in an experiment, in which 25 people performed typical knowledge work (writing reports, making presentations, reading e-mail, searching for information). We manipulated their working conditions with the stressors: email interruptions and time pressure. 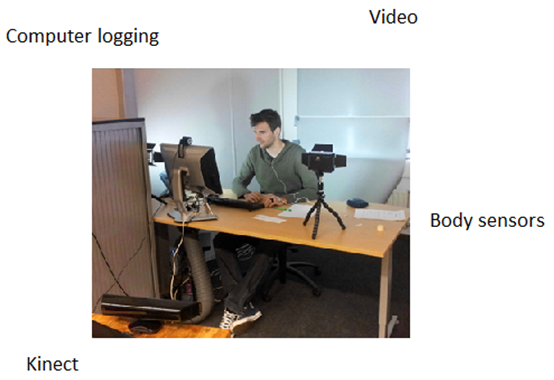 A varied set of data was recorded: computer logging, facial expression from camera recordings, body postures from a Kinect 3D sensor and heart rate (variability) and skin conductance from body sensors. Our dataset not only contains raw data, but also preprocessed data and extracted features. The participants' subjective experience on task load, mental effort, emotion and perceived stress was assessed with validated questionnaires as a ground truth. The resulting dataset on working behavior and affect is suitable for several research fields, such as work psychology, user modeling and context aware systems. The SWELL-KW dataset was collected within the SWELL project. The collection of this dataset was supported by the Dutch national program COMMIT (project P7 SWELL). Besides sensor data, we provide the questionnaire ratings of the participants on task load (NASA-TLX), mental effort (RSME), emotion (SAM) and perceived stress for each working condition. The dataset can be accessed medio 2015 here: SWELL-KW dataset. Koldijk, S., Neerincx, M.A., & Kraaij, W. (in press). Detecting work stress in offices by combining unobtrusive sensors. IEEE Transactions on Affective Computing. Sappelli, M., Verberne, S., Koldijk, S., & Kraaij, W. (2014). Collecting a dataset of information behaviour in context. In: Proceedings of the 4th Workshop on Context-awareness in Retrieval and Recommendation (CARR @ ECIR 2014) (Amsterdam, The Netherlands, 13-16 April 2014). Koldijk, S., Sappelli, M., Neerincx, M., & Kraaij, W. (2013). Unobtrusive monitoring of knowledge workers for stress self-regulation. In: Proceedings of the 21nd Conference on User Modeling, Adaptation and Personalization (UMAP 2013) (Rome, Italy, 10-14 Juli 2013). Koldijk, S., Neerincx, M., & Kraaij, W. (2014). Using sensors in the office to support knowledge workers with self-management of well-being. In: Proceedings of Well-being at Work 2014 (Copenhagen, Denmark, 26-28 May 2014). Koldijk, S., Neerincx, M., & Kraaij, W. (2012). Unobtrusively measuring stress and workload of knowledge workers. In: Proceedings of Measuring Behavior 2012 (Utrecht, The Netherlands, 28-31 August 2012). Koldijk, S., van Staalduinen, M., Neerincx, M., & Kraaij, W. (2012). Real-time task recognition based on knowledge workers’ computer activities. In: Proceedings of the European Conference on Cognitive Ergonomics (ECCE 2012) (Edinburgh, Scotland, 28-31 August 2012). Koldijk, S. (2012). Automatic recognition of context and stress to support knowledge workers. In: Proceedings of the European Conference on Cognitive Ergonomics (ECCE 2012) (Edinburgh, Scotland, 28-31 August 2012; doctoral consortium). Koldijk, S. (2012). Capturing context and mental state of knowledge workers. In: Proceedings of the Fourth Information Interaction in Context Conference (IIiX 2012) (Nijmegen, The Netherlands, 21-24 August 2012; doctoral consortium). Koldijk, S., van Staalduinen, M., Raaijmakers, S., van Rooij, I., & Kraaij, W. (2011). Activity-logging for self-coaching of knowledge workers. In: 2nd Workshop on Information Access for Personal Media Archives (IAPMA @ ECIR 2011) (Dublin, Ireland, 18-21 April 2011). Koldijk, S. (2011). Look what you’ve done! Task recognition based on PC activities. Masters’ thesis. Radboud University Nijmegen, The Netherlands.